The fourth ship in the Disney Cruise Line flotilla, the Disney Fantasy is jam-packed with things to do. That is by design. After all, passengers need activities to keep them occupied. But, it's not just the quantity of things to do, it's the nature of the activities that distinguishes the Disney ships, and the Fantasy in particular. Imagineers, the fabled designers who conjure Disney's park attractions, also bring the cruise ships to life. So, it should come as no surprise that there is plenty of crossover between the two. That's not to say that guests should expect a ride aboard the Tower of Terror or a spin on Dumbo as they sail the seas (although there is an honest-to-goodness coaster on the Fantasy—more on that later), but Disney fans will find plenty of the same kinds of whimsy, charm, and pixie-dusted technological magic that make visits to the parks such a joy. There is wonderful food offered on the ship, the staterooms are great, the level of service is top-notch, and the Fantasy excels at other things you'd expect from a high-end cruise line. But let's take a journey around the ship and explore the many highlights that will delight, thrill, and amaze theme park fans. Other cruise ships have water slides, but the Fantasy's sister ship, the Disney Dream, was the first to introduce a water coaster. The wet and wild fun continues aboard the Fantasy, which offers its own AquaDuck (great name!). If you start hyperventilating at the mere mention of the term, "coaster," have no fear. Well, have a tiny bit of fear. The AquaDuck is relatively tame, and all but the most thrill-averse should be able to handle it. On our thrill-o-meter scale (0=Wimpy!, 10=Yikes! ), we give it a 3 for mild bursts of speed. Because it is so popular and it is slow loading, there are often long waits of 30 minutes to an hour or more. But the views on the stairway leading to the ride, which is among the highest points on the ship, are spectacular, so who cares about waiting? Passengers need to be a bit agile to climb into (and out of) the two-person rafts. There are no safety belts; riders hang on to the raft's handles to secure themselves. A short conveyor belt deposits each raft into the ride's enclosed tube. After a small drop, the rafts enter a banked curve and travel a straightaway along the port side of the ship. Gravity and a steady stream of water keep the rafts moving at a fast, but not out-of-control clip. They pick up a bit of speed when they hit a small dip in the tube and accelerate slightly when jets of water propel the rafts uphill. There is a second dip/blast/uphill element during the port-side run. The speed, acceleration, drops, banked curves, and uphill blasts are quite mild compared to most uphill water coasters, such as the Crush 'n' Gusher at Disney World's Typhoon Lagoon. Some water coasters actually deliver abbreviated moments of airtime as riders crest their hills, but the toned down AquaDuck lacks the requisite oomph. Still, the coaster does feature a clear acrylic tube which provides passengers with a thrilling view as they travel 14 decks above the ocean. At the far end of the oval course, the AquaDuck briefly enters one of the ship's stacks, and Disney provides some Space Mountain-like effects with colorful bursts of light that make it appear as if the rafts are moving faster than their actual speed. Reemerging into the light on the starboard side, the rafts slow considerably to an almost lazy river pace. The more relaxed speed allows riders to soak in the views of the vast ocean, wave to their shipmates on the deck below, and consider just how crazy it is that they are riding a water coaster—aboard a ship. The rafts take a final small drop down one deck to deposit passengers in the unload area. Many riders make a beeline to the stairs up to the loading platform for a re-ride. It's no wonder the lines are always long. In addition to the AquaDuck water coaster, the ship offers plenty of other ways to enjoy water park-like fun, including the AquaLab water play area. Unique to the Fantasy, AquaLab offers all kinds of interactive sprayers, water cannons, and other gizmos to douse those triggering the effects and everyone around them. The area is quite cute as is its backstory. Donald Duck's nephews, the interchangeable Huey, Dewey, and Louie, designed the AquaLab as a way to generate the water pressure needed to keep the AquaDuck flowing. There is even a pipe leading from the lab to the ride with crude lettering and arrows to indicate how the whole contraption is supposed to work. Passengers of all ages can find water park-style fun on the Fantasy. Nemo's Reef allows little squirts to get in on the action with a collection of colorful sprayers and small slides themed to Finding Nemo. There is also a twisting water slide that is propped up by a giant Mickey Mouse hand, a pool for families, and a pool for younger children. It's not all family fun, all the time on the ship. An adults-only area offers the appropriately named Quiet Cove pool. And the Satellite Sun Deck, a Fantasy exclusive, features Satellite Falls, a small wading pool with a steady, soothing water curtain. Of course, no trip to a Disney theme park would be complete without meeting the Disney characters. Likewise, having some face time with Mickey and the gang is a must aboard a Disney ship. There are a multitude of characters at multiple locations throughout the ship, many of them dressed in their finest nautical gear. Captain Mickey looks especially sharp in his outfit. The times and locations are published daily in the Personal Navigator that the crew leaves in each stateroom. With so many opportunities and a limited number of passengers, everyone is virtually guaranteed a minimal wait and some quality hang time with the characters. Near the ship's Bibbidi Bobbidi Boutique, little princesses can meet Disney's princesses. The royal characters seem to be particularly patient and indulge their little subjects with a more generous amount of time than they typically are able to provide in the parks. Make sure to have your camera handy for the character meet-ups. But don't fret too much if you forget it. A Disney photographer is always at the ready in the meet-and-greet areas—and around the ship. The Fantasy crew prints all of the photos and places them in a folder for the guests in each stateroom to review. Disney is only too happy to sell passengers the photos (along with imprinted frames, folders, and all kinds of other accessories) for fairly hefty fees. 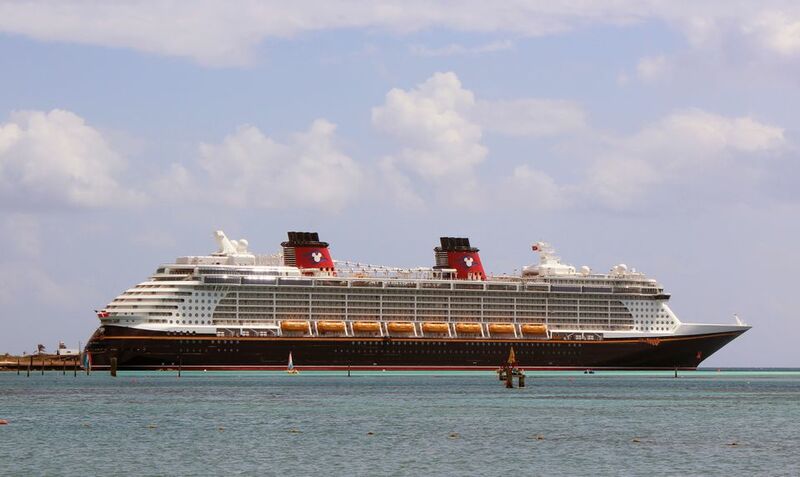 With its family focus, Disney is one of the few major cruise ships that does not include a casino. But it may be making up at least some of the gambling revenue with its photo sales. Animation has always been front and center at the Disney theme parks. From the storybook castles that provide their focal points, to the characters that walk the streets, to the stories that inspire the attractions, Disney's animated classics are in the spotlight. Pavilions at both Disney California Adventure and Disney's Hollywood Studios takes guests behind the scenes to learn about the animation process. The Fantasy gives guests the opportunity to actually become animators in a stunning, utterly unique presentation. On one of the evenings that they dine in Animator's Palate, one of the three main dining rooms on the ship, guests are given markers when they arrive at their table and told to draw a character on their placemats. For inspiration, scenes about food culled from classic Disney animated films (the "Be Our Guest" dining room scene from Beauty and the Beast for example) play on large monitors throughout the dining room. The waitstaff collects the drawings. About midway through the meal, Mickey Mouse appears onscreen to inform diners that something special will be coming shortly. A few minutes later, the lights dim, and, incredibly, the characters that guests drew begin dancing, skating, and engaging in other activities in an animated production. It simultaneously delights and baffles the audience of would-be animators. "There's nothing more exciting than when you see your animation come to life," says Joe Lanzisero, senior vice president, creative at Walt Disney Imagineering, and one of the chief designers of the Disney Fantasy. As a former animator, he certainly knows about the joys of watching his sketches first dance and skip across a screen. It is no less of a thrill for amateur animators. Arms flail, legs articulate, bodies rotate, and other movements occur as the cast of characters perform one amazing choreographed scene after another. It doesn't matter whether the drawings are simple or highly refined. Somehow, the show's impressive technology seamlessly blends everything together. A minute or so into the presentation, the characters begin interacting with Pinocchio, the Genie from Aladdin and other Disney stars. That's when Animation Magic really turns on its magic. Channeling Walt Disney, who once said something similar about building Disneyland, Lanzisero says that creating Animation Magic is "one of those things that proves it's fun to do the impossible." The signatures that diners provided on their placemats appear as the credits roll. At the end of the (delicious) meal, the waitstaff returns the drawings, which are adorned with gold "Official Animator" labels to the artists. First introduced on the Fantasy, Animation Magic is a striking Imagineering breakthrough and one of the highlights of the cruise. One of the most underrated Disney attractions is Turtle Talk with Crush, which is presented at both Epcot and Disney California Adventure. The character from Finding Nemo, who is known for his laid-back demeanor and his surfer-dude patois, interacts live with guests in an astonishing display of real-time animation. Hey! An Elephant Just Flew Past My Porthole! Let's cheat a bit on this highlight from the Disney Fantasy, because there is no theme park equivalent to the ship's "magical portholes." Essentially, Disney has taken a liability–a cruise ship's windowless inside staterooms—and has turned it into an asset with its whimsical portholes. Like the enchanted art throughout the ship, the portholes are actually monitors. In this case, they broadcast transmissions of cameras placed on the exterior of the ship. While they are not real windows, they do offer a real-time view of what is happening outside. Every few minutes, however, fantasy interrupts reality when an animated Dumbo flies by, a starfish from Finding Nemo crawls past, or some other animated character makes a fleeting appearance. The portholes are enchanting and really open up the otherwise claustrophobic quarters. They have become so popular that Disney says guests who could otherwise afford to upgrade to the pricier outside rooms opt for a chance to stay in a room with a "magical porthole." The water park fun doesn't stop when the Disney Fantasy docks at Castaway Cay, Disney's beguiling private island in the Bahamas. Pelican Plunge offers a couple of water slides with a unique twist: They plunge into the ocean. Located on a floating platform a few hundred feet from shore, riders have to swim out (and back) to enjoy the plunge. The body slides, one enclosed and one open, aren't particulalry tall or fast, but they are fun. In addition to the slides, there is a small bucket atop the platform that spills its content without making the usual big splash associated with water park dump buckets. There are also a couple of water cannons that guests can aim at bouys to make propellers spin and trigger other events. Small children can have water park fun on Castaway Cay as well. The water play area, Spring-a-Leak, features fountains and jets that offer wet fun and respite from the tropical heat. It's also a great place for kids to expend some energy and stay cool at the same time. Hair, makeup, costumes, nail polish: Put it together and what have you got? Bibbidi Bobbidi Boutique. The beauty salons that transform little girls into princesses at Disneyland and the Magic Kingdom has proven enormously popular. Royal makeovers are also available on the Disney Fantasy. The boutique offers packages that include options such as hairstyles (will that be a Snow White bob or a flowing Jasmine look, young lady? ), sashes, wands, tiaras, shoes, and more. The salon also offers pirate makeovers for both boys and girls, although they seem to be far less popular. The Fantasia Gardens and Winter Summerland miniature golf courses at Walt Disney World are a hoot and combine traditional mini-golf fun with Imagineering ingenuity. The nine-hole Goofy's Golf on the upper deck of the Fantasy isn't as elaborate or inventive as Disney's land-based courses, but they are still fun (and, in case you forgot, located on a cruise ship for crying out loud). Playing a round doesn't require any additional fees. Players pick their own "goofballs" and choose a putter from a bag labeled "Max's Country Clubs." The themed course has to do with Goofy offering tips (in his inimitable Goofster way) about how to play golf. The holes are strewn with oversized props including lawn mowers, broken eyeglasses, and textbooks. There's even one with a kitchen sink. We are not sure why it's there (maybe because the course contains everything but the...), but it's certainly eye-catching and whimsical. While we didn't see it happen, we wonder how often errant balls are hit over the side of the boat and lost at sea. 3-D attractions such as It's Tough to Be a Bug at Disney's Animal Kingdom have long been theme park staples. But 3-D films have been showing up with greater frequency at neighborhood multiplexes. There is no dedicated 3-D attraction aboard the Disney Fantasy, but the plush Buena Vista Theatre shows first-run films (from Disney and its studio affiliates naturally), including 3-D movies. You won't get the theme park "4-D" experience), but you will get the goofy glasses and the latest Hollywood attempt at adding dimension to films. Sure the Disney parks have Star Wars: Galaxy‘s Edge, but you could have some intergalactic fun aboard the Fantasy on select sailings. The special cruises, which include what Disney calls “Star Wars Day at Sea,” include meet-ups with characters such as Kylo Ren, Darth Vader, and R2-D2, live shows, activities, unique food, and a finale deck party. Fireworks? On a Ship? Yup. There is perhaps nothing more iconic at any Disney theme park than fireworks exploding over a storybook castle. Nearly all the parks have a pyrotechnic-filled kiss goodnight show. And wouldn't you know it? The Disney Fantasy has a fireworks show as well. The only cruise line to offer fireworks at sea, the Fantasy lights the sky on the night that it features pirate-themed fun. In true Disney fashion, it isn't a few random bursts fired into the air, but part of a choreographed show. Passengers get into the yo-ho spirit during dinner by donning 'do rags and other pirate gear distributed in the ship's dining rooms. They assemble on the pool deck (with floorboards placed over the pools to accommodate the large crowds) and watch a film presentation on the Jumbotron screen that kicks off the Pirates IN the Caribbean celebration. Human pirates than emerge from behind the screen to take over the ship, but are thwarted by Captain Jack Sparrow. He rises out of the top of one of the ship's stacks and rides a harness down to engage the menacing pirates in a corny skit that involves swordplay, Poseidon, and a golden goblet. When Jack takes possession of the goblet, he tosses it skyward to launch the Buccaneer Blast fireworks. By Disney park standards, the fireworks aren't all that spectacular. But, the fact that they are even included on a ship is pretty amazing. Flares fired from both of the funnels accompany the firework blasts on the starboard side of the ship. The whole shebang is synchronized to music. While the show isn't worthy of a Disney castle, the finale is nonetheless impressive. The show is followed by Club Pirate, a themed dance party on the pool deck. Can You Name 9 Great Cruise Ship Movies? Are You Safe From Pirate Attacks on Your Cruise?